Hello SaltLakeCity - SLC Brewery Roll! The Brewery Roll of Salt Lake City is the tour that mixes the exciting, exploratory nature of an urban bike-tour with the tasty adventure of sampling microbreweries! Groups ride bikes (provided) to a few curious points of interest in the greater downtown area, both historical and current. Multiple stops along the way for breaks, photos, and good old rest. Then, together, we visit the best breweries around town. Take in the atmosphere, take a load off, take a drink! Your purchase comes with a complimentary sample form each brewery, and if you'd like to take in more than that, you are welcome to do so, providing that you're willing to pick up your tab. Questions are fielded by your personal, friendly, and locally-based tour guide. Each location has food options as well, so getting a bite to eat is an easily accessible option. We provide bicycles, helmets, water in bottles to drink, one sample at each brewery, and of course, the guided experience. Choose from a late afternoon, or evening departure time for this Brewery Roll of Salt Lake City. The guided, 3 to 3.5-hour tour begins at Liberty Park, Salt Lake City's largest and oldest park. Pedal, as a group, to Gilgal Gardens, a strange and secretive sculpture garden, with Mormon origins. Then head on to an architectural crown jewel of our town, the SLC Public Library, where we have the option to explore from the rooftop and on down. Then, we head through the City past street-food vendors and local businesses to the town's district of microbreweries. 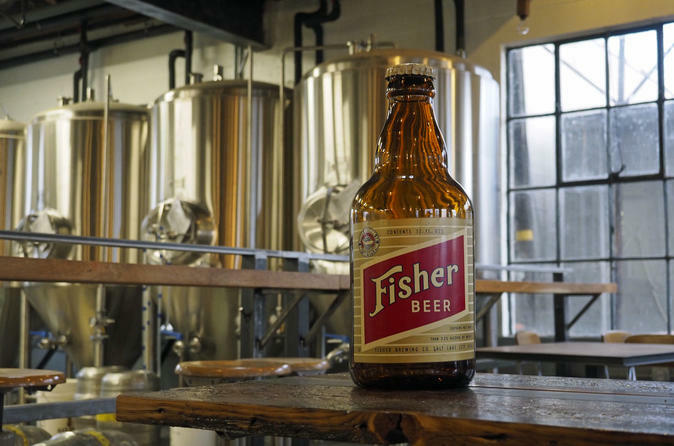 We'll visit A. Fisher Brewery, Proper Brewing Company, and Kiitos Brewing Co., and if we have time, we can visit even more, like Epic Brewery and Roha Brewery. After we've had our taste buds satisfied, we'll head back to the beginning, the comfy confines of Liberty Park. Bicycles, helmets, and water are included, along with a complimentary sample at each brewery we visit. Beyond that, if you'd like to get a pint, for instance, you are welcome to do so, providing that you are able to pick up your own tab.